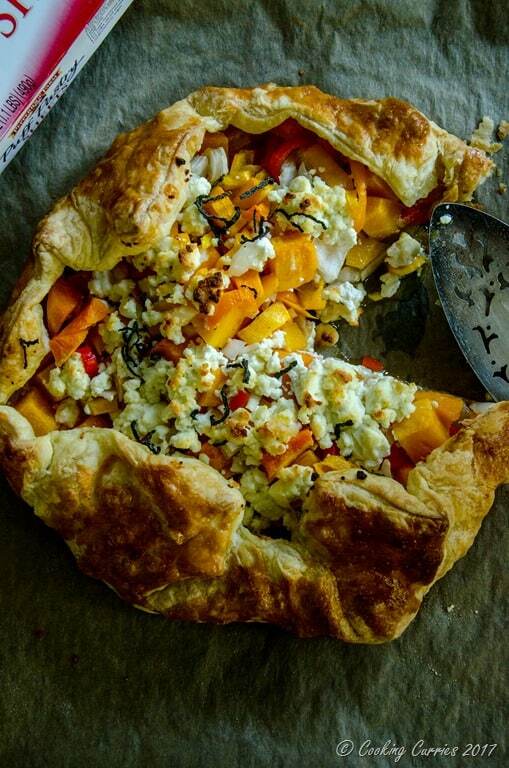 Welcome fall with this delightful Butternut Squash and Goat Cheese Galette made easy with Pepperidge Farm® Puff Pastry! Fall is here and so are the fall bounties. One of my most favorite fall vegetable is the Butternut Squash. Way more than pumpkin anything. Recently I had the combo of butternut squash and goat cheese in some dish at a restaurant and I loved it so much, that I tucked away the combo reference for future use in my brain. The future was not too far and I used it to make an amazing dinner for us over the weekend. Whenever I thought of galette, I always think of something sweet. Something that is made painstakingly. The image that comes to my mind is someone working with the pastry dough in the kitchen, for hours and covered in flour. I love spending a lot of time in the kitchen, but that’s not my idea of a weeknight dinner and definitely not my idea of time spent on just one dish. If I spent that much time in the kitchen, I am getting out with a refrigerator full or at least 5-6 dishes to last us a few meals. That’s where the Puff Pastry magic comes in. 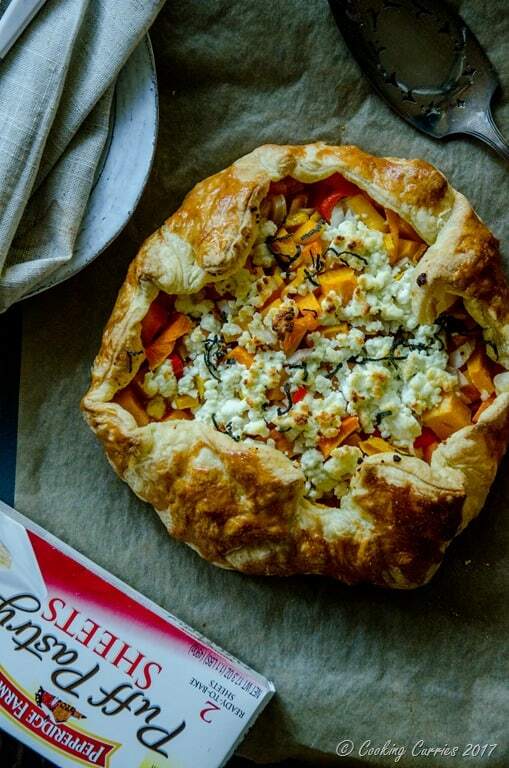 I used Pepperidge Farm® Puff Pastry as my dough for this savory galette, that took me way less time than it would have to make my own pie dough and the flaky delicious crust made it so much more delightful. Trust me, you guys, it takes so less time to make this. Once you have the thawed Puff Pastry Sheets ready for you, all you need is mix up the filling, roll out the Puff Pastry Sheet, add the filling, do a rough fold over the top, bake and ta-da, dinner is ready!! In a medium sized bowl, mix together the butternut squash, onions, peppers, salt, black pepper and olive oil. Roll out the Puff Pastry Sheet, dusting flour on both sides, just a little bit, not too thin. Add the butternut squash mix to the center of the Puff Pastry Sheet. Top with goat cheese crumbles and sage. Fold the Puff Pastry Sheet inside, in a rough manner, to form the shape of a rustic looking galette. Bake in the preheated oven for 20-25 mins. Cool down a little in the baking sheet. Cut and serve immediately, while still hot. This galette just looks amazing, so elegant and just perfect for a dinner party I will be throwing during the holidays. Thank you so much, we can’t wait to try it, we love using puff pastry sheets. I cannot imagine life where I did not have Pepperidge Farms Puff Pastry in my freezer. They are such a life saver when you have unexpected guests and have to hustle something awesome quick! Loving this galette. Must try soon! What a beautiful way to celebrate fall with a lovely galette! I love how easy it is to make with puff pastry! Thank you! Yes, Puff Pastry does make it a whole lot easier! ? Oh my word!! That looks really delicious! I love eating homemade galette. This is such a great idea and I can’t wait to try it. 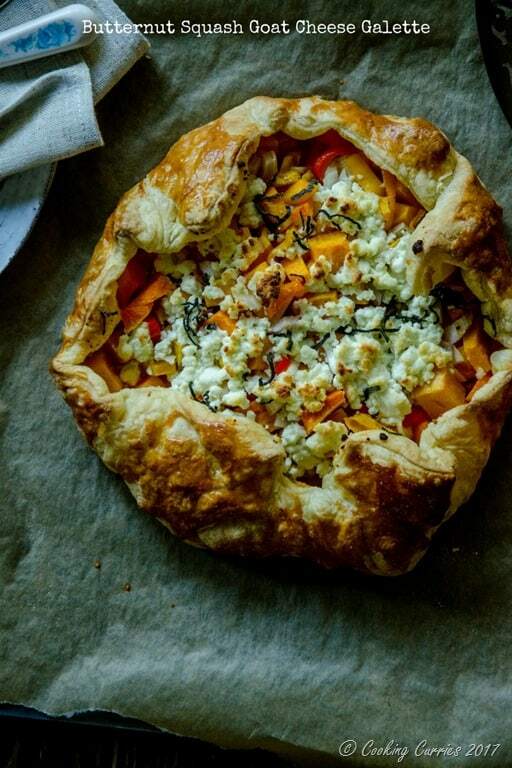 Goat cheese is perfect in this galette. Oh my gosh! That IS for the egg wash! I have it in the video, guess I missed writing in the instructions. Thank you for pointing it out. I’ll edit it soon!